Dominic Thiem was tested before reaching the Argentina Open semi-finals, while John Isner cruised through in New York. 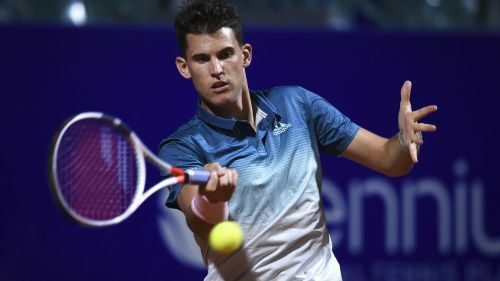 A two-time champion in Buenos Aires, Thiem overcame Pablo Cuevas 4-6 6-4 6-3 in their quarter-final on Friday. The top seed improved to 11-0 at the ATP 250 event, where Diego Schwartzman awaits in the last four. The fourth-seeded Schwartzman was too good for Albert Ramos-Vinolas in a 6-1 7-5 victory. ¡@dieschwartzman es el último semifinalista! The other semi-final will see Italian third seed Marco Cecchinato meet Guido Pella. Cecchinato got past Roberto Carballes Baena 7-6 (7-3) 6-4, while Pella saved four match points in a 6-7 (3-7) 7-6 (11-9) 6-1 win over Jaume Munar. At the New York Open, Isner served 16 aces in a 6-4 6-1 win over Australian seventh seed Jordan Thompson. He will face fellow big-serving American Reilly Opelka in the semi-finals after the 21-year-old beat Guillermo Garcia-Lopez 6-3 6-4. Last year's runner-up Sam Querrey overcame Jason Jung 6-3 3-6 6-3 and next meets Canadian qualifier Brayden Schnur, who edged Paolo Lorenzi 6-7 (7-9) 7-6 (7-5) 7-5.